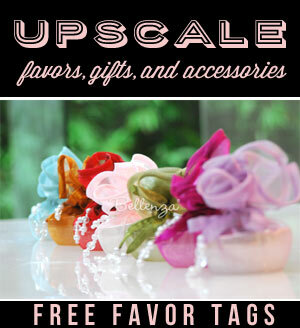 Home / Inspired Creations / 14 Unique Save-the-Dates for Your Tropical Beach Destination Wedding! 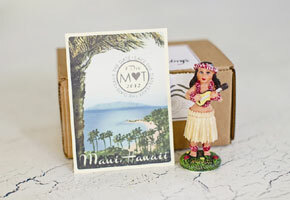 If a tropical destination wedding is within your horizon, sending out your save-the-dates could not be more exciting as stationers are offering up a variety of designs in styles and colors that are all teeming with a fun and creative vibe. Tropical fruits, exotic destinations, palm leaves, colorful tropical flowers are just some examples of what we are seeing in one of this season’s most sought-after style for planning a destination beach wedding. 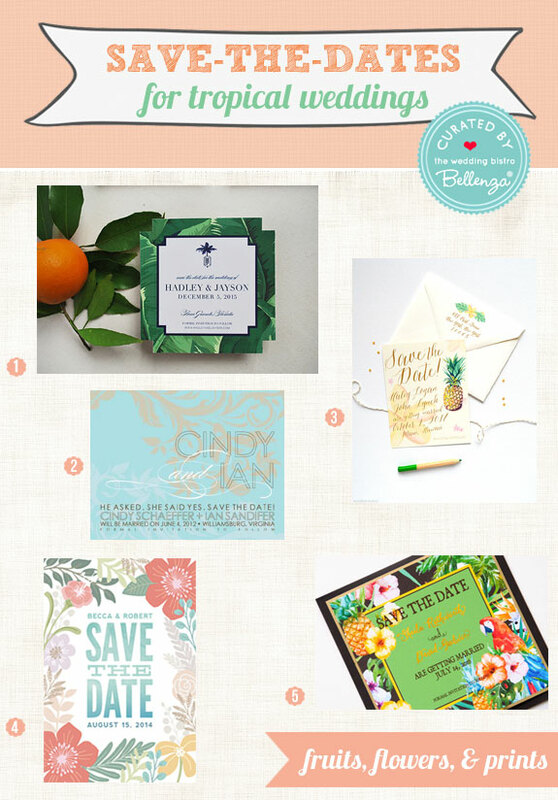 Pretty Styles We Love for Tropical Beach Save-the-Dates! 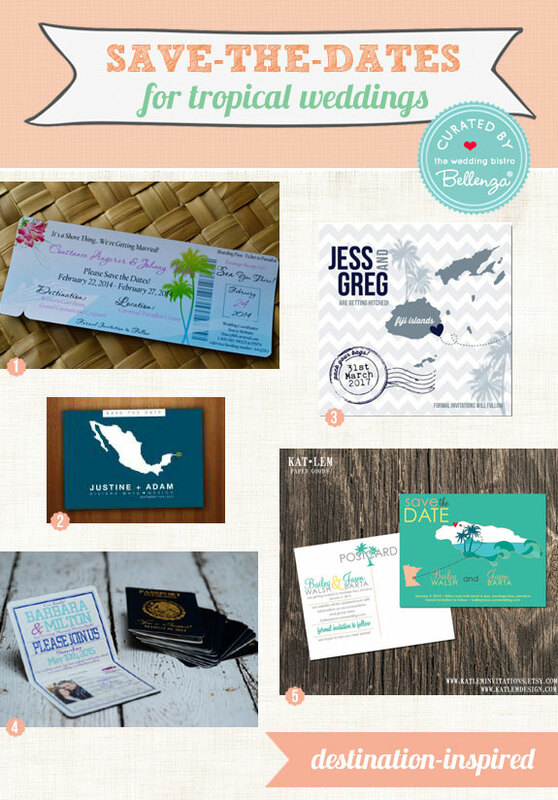 Beautiful destination-inspired designs of places like Fiji, Puerto Rico, Jamaica, and Mexico bring your guests an immediate idea of the location where you will be tying the knot, while a boarding pass theme that doubles up as either a magnet or luggage tag serves a very practical purpose and reminder of your special day! 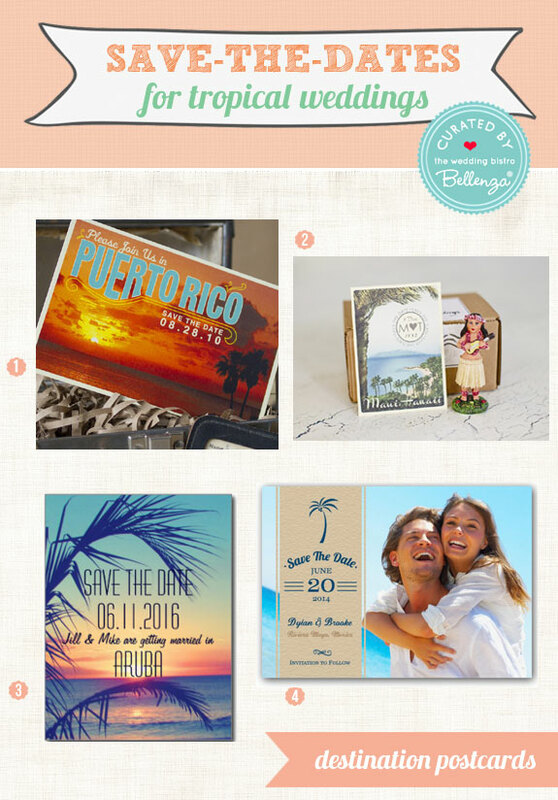 Passport themed save-the-dates are also a wonderful option for a destination beach wedding. They can be printed with all of your preliminary wedding details, so guests can ink in their calendars early in the year. There is also definitely no shortage of color when it comes to tropical save-the-dates as you will see in many designs with a burst of tropical flowers rendered in watercolor, tropical fruits like pineapples, palm leaves of various shapes and sizes, including fancy Bali-inspired swirls and patterns. Finally, post cards in both modern and vintage designs have become very popular options for personalizing your wedding save-the-dates! 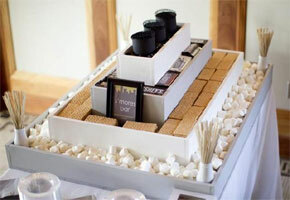 Brides love the look of having their destination as the focal point of their save-the-date. A picture of the bride and groom as the backdrop of their save-the-date is also a great personalization option, while incorporating a fun toy or keepsake with your announcement adds a unique, whimsical tone! Finding save-the-dates for a tropical destination wedding has never been more fun as you have seen in these stylish options! 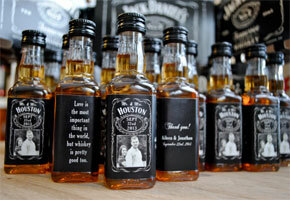 How will you be announcing your wedding? Previous Donut Walls: The Sweetest Wedding Food Trend You’ll Want to Grab! Next Design Your Own Engagement Ring: Virtual Design Services!